Don’t you wish there was a way to fry foods without all of the oil? Foods like french fries, chicken and onion rings, among others, all taste great when they are fried, but the trade off is calories while eating oil soaked food. Many foods can be cooked to a slight crisp in a toaster oven but if you’d rather not give up that much counter space to one, the Gourmia GTA2500 Electric Digital Air Fryer Griller and Roaster can be a decent alternative with a few restrictions. Many people frown on extra calories, for good reason. It’s all about the extra fat and the oil from fried food, as you have to worry about the cholesterol gumming up your arteries. Still, fried food is one of the tastiest foods around, and many fast food joints make a living from the fryer. However, for home use, there is a technique called air frying, that uses both radiant heating and convection currents with a fan to circulate hot air around the food. This approach crisps up the outer edges, just like frying does, yet keeps the inside moist and tender. You basically get all of the taste of fried food without all of the extra calories because you can use little or no added oil on the food. That’s healthy eating and that’s exactly what the Gourmia Electric Digital Air Fryer is all about. There are other smaller air fryers that you may be interested in, but the difference here is the ability to do a lot more than just fry foods with less oil. This versatile machine allows you to bake, fry, roast, steam veggies, defrost and even make a 10 inch pizza because you can control temperature and there are several attachments provided to assist with each method. This all-in-one appliance cooks fast and always makes the food taste wonderful, and you may never fry chicken, or anything else, again. The body is made of heavy duty insulated plastic to keep the heat inside, and the top is made of tempered glass. It most resembles an indoor kettle grill with a hinged top. It’s heavy, at about 18 pounds, so it will stay put on your counter when in use. It features a computerized digital read-out that is programmable for time and temperature. It also has pre-set buttons for specific foods like pizza, roasts, fish, defrost and more. The Gourmia comes with accessories galore. There is a cylindrical rotisserie basket, steam and bake pans, high and low broil pans, frying and crisping basket, a steel mesh filter, kabob rack and tongs. All these will allow you to cook just about any type of food imaginable in several different ways. The interior is non-stick, so it will be easy to clean. The accessories are safe for dishwasher cleaning, so those are also a breeze. The radiant and convection design cuts cooking times down to almost 60%, and that is getting into microwave cooking speed. This is a very fast way to cook meals for you or your family. Reading the directions is key here because if you leave food in just a smidgen too long, it will overcook and potentially burn. Don’t try to stuff the pans and baskets with too much food, or some pieces will turn out limp instead of crisp or they will cook unevenly. The pre-sets work well for the desired amount of food added, but consult with the instruction booklet for the maximums and minimums that the pre-sets are capable of cooking. It’s always good to experiment with a unit that is as versatile as this one. However, always err on the short side when putting in time to cook. You can always add time if the food is under done, and you’ll get a good feel of what to expect with certain types of foods, whether you are roasting, steaming or air frying. Fast cooking with speeds that approach microwave quickness. Good control panel that is easy to see, in light or dark. Accessories for virtually anything that are all dishwasher safe. Interior clean-up with a damp cloth. Modern design that will look good if left out on the counter. Although easy to program, the first few times you cook with it, you’ll want to make sure your food doesn’t burn. Heavy and bulky. It is best left in one place and if moved for storage, you may have a difficult time finding room in a cabinet. While quite big, don’t expect to cook huge quantities of food in it. A 6lb chicken will not rotate as it will get stuck at the bottom or top of the fryer, so get a slightly smaller bird or turn off the rotisserie function. The instruction guide is not as detailed as it could be. It will tell you which accessory to use for each type of cooking but if you want to know how to use it, go to Gourmia’s online user manual. The upper glass lid gets very hot to the touch. The price might be a bit high, but this is a quality product. What’s not to like? Yummy frying without oil almost sounds too good to be true. Yet, you can do just that with the Gourmia. But versatility is its real strong point. You can steam food with the best of them, or put a chicken on the rotisserie and let all the fat drip away. The fry basket means you won’t have to worry about losing bits of food as it turns. The veggies basket lets you load it up with corn on the cob, squash, eggplant, etc. and it will come out delicious as it tumbles around in the heat. You can air fry for crispy food on the outside, with moist and tender insides. 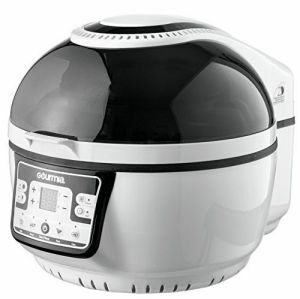 If there’s one instance where you should think twice before buying the Gourmia GTA2500 Electric Digital Air Fryer Griller and Roaster, is if you already have a good convection toaster oven in your kitchen. You won’t get the automatic rotating that the Gourmia provides for even cooking and it will take longer to cook, but it is possible to make fries, roast chicken, cakes, etc. in the oven.